Last modified on 2011-09-20 18:43:07 GMT. 0 comments. Top. Yesterday, our first day we slept through the day and got up when temperatures had moderated in the evening. It didn’t feel too hot. Today, we were out early on the farm and through the day in the heat. Tonight it feels very warm. Mosquitos are hovering in clouds outside our door. Both events contribute to a feeling of being besieged in our house this evening. A number managed to sneak in and we are busy swatting them. 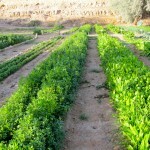 We had a lovely dinner of chard, silak, arugula, and mouloukhia with red lentils and lemon basil. I put a tomato sauce over it all. It would have better with garlic and onions, which we don’t have yet as both vehicles we usually have at our disposal are getting fixed. We also don’t have our very refreshing, good-as-the-real-thing-non-alcoholic beer. Today the farm had a visit of 22 Chinese people who are here on oil business. They apparently wandered into the farm last week, lost, and asked for a tour. The Prince happened to be here and spoke to them. 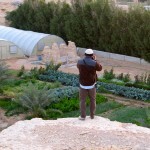 He offered to set up a tour of the farm and Diriyah- and today they came in a bus. We spent the rest of the day going over the farm tasks and practices with the new farm manager, Paul. The most cheerful aspect of the farm is all the lovely birds singing and carrying on from the earliest hour before the sun touches the top of the palm trees and all life slows. Sparrows, bulbuls, doves, pigeons, a mynah like bird, a flycatcher, an all black fly catcher like bird, a warbler of some variety and others frequent the premises of the farm. The sparrows are the only ones who eat plants, and they are like winged locusts. 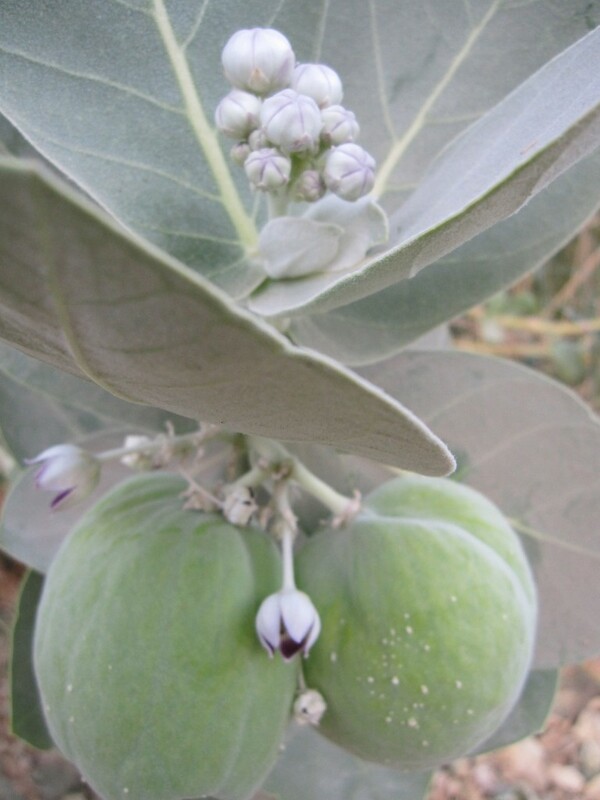 At noon today, when the workers had gone to lunch, the atmosphere was palpably quiet, with only the thistle down of the Calotropis procera flowers (like milkweed down) floating through the still air. Its common name is Sodom’s apple, a stern name for such large and soft inflated pods that burst open ad deflate in the hot sun to reveal its seeds assembled as perfectly as fish scales with the down neatly folded in anticipation of silent flight. The shrub has striking, oblong, white felted leaves that stand out in a statement of white against the prevailing desert taupes and an abstract modernism in a conformist land. Nothing eats its leaves as they contain toxic white sap. We are cleaning up beds and planting seeds, trying to get the farm in order. 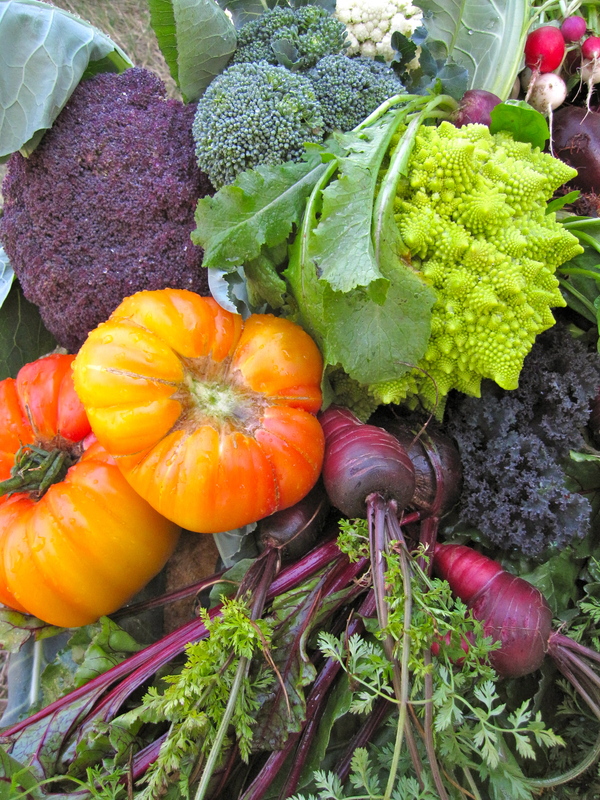 We planted cauliflower purple of sicily, romanesco broccoli, pac choi, red pac choi, bok choi, mizuna, red mustard, ruby streaks mustard, red carrots, purple carrots, white carrots, leeks, lettuce, spinach, red spinach, red, and gold chard, sunflowers, alyssum, cosmos and more. It is about 102 or more in the afternoons. It peaks around 3:30 and the temperature falls to the low 90’s at about 6:00. Dark comes quickly and so so millions of mosquitos. Apparently it has been too hot for them until now and the cooler nights allow the eggs to hatch. As we were finishing planting around 6:00, I noticed what looked like a tiny figure watching us from a small cave in the limestone bluff above the quarry garden. It was so still and the light was dim inside the cave, that I wasn’t sure it wasn’t a rock, but looking closer I could see a small head, torso and legs, all perfectly still. 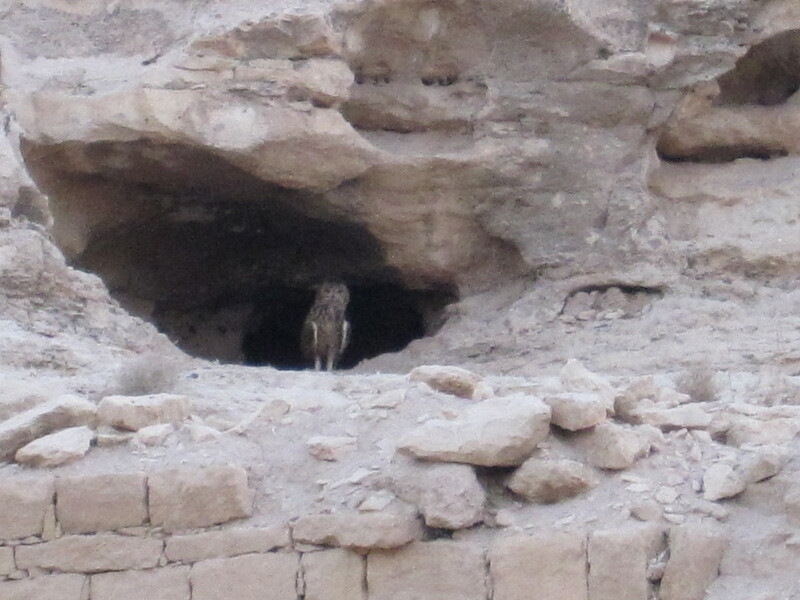 I realized it was the Pharaoh Eagle Owl we had seen the other night. We ran and got our cameras- and we stared at it and it stared at us as we swatted legions of mosquitos. We moved off so we didn’t alarm it and could then see its little head above the rock where it had walked outside and was watching us. Dusk was seriously descending and the mosquitos were attacking so we left. We never saw an owls den before. Last modified on 2011-06-06 03:39:24 GMT. 0 comments. Top. What is spring? We picture a fecundity of lush vegetation: of fat flowers, of soft meadow grasses, and thick canopies of fresh green, of gentle, fragrant breezes, clouds of succulent vegetation. This is a garden of the imagination. 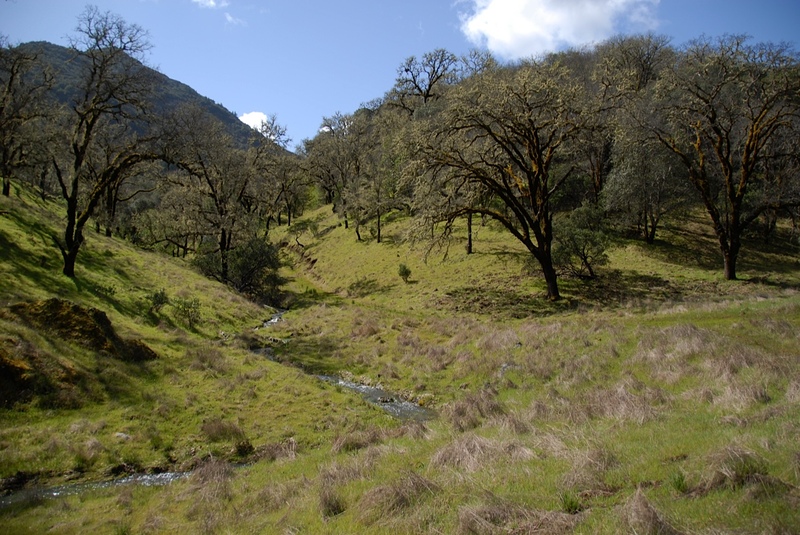 In California spring carries a different visage, a reflection of the harshness of the environment, of the pale blue dome of the sky, the infertile soils, the sun that dominates every aspect of life. The California spring contains the moments where life breathes easily before the sun and arid heat beats all life down for months that seem endless, and where detail disappears. Each moment carries significance, energy exploding in tiny detail, but most intensely in the minute loveliness of the flowers. Each species invites close examination, and contain worlds far beyond what one would think some of the world’s most infertile soils could generate. The Bird’s Eye Gilia’s 5-petaled flowers have lavender edges fading to white, but the throat is a deep black and the anthers and pollen are fluorescent blue. The whole diminutive thing smells like violets. The cream cups- Platycodon californicus similarily have pale yellow edges, fading to cream in the center and have multiple stamens of delicate definition like a Japanese painting in cream. 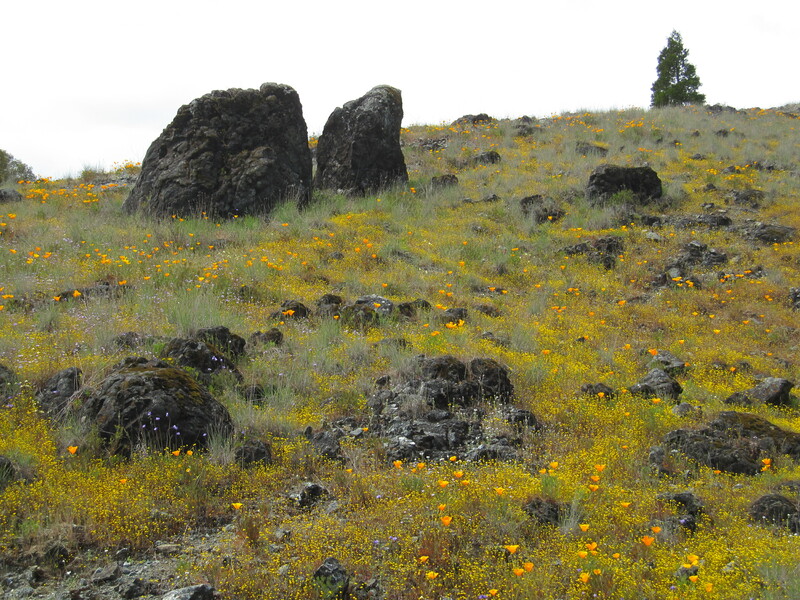 The California poppies scream life among barren grasses and landscapes. 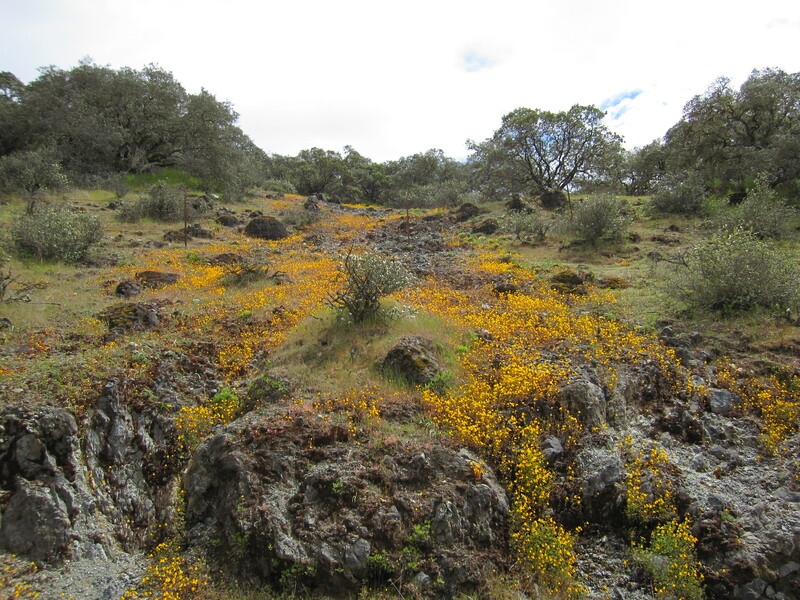 Goldfields are sprinkled like raindrops from the sun…………….. This landscape invites close examination and pausing. It is a land where we must take the moment to see because the details are so fleeting and may not reappear. What is hierarchy? As humans we feel we are the most powerful beings. We are at the ultimate point of our power, yet if we pause for a moment we can feel diminutive among the diminutive. These landscapes contain a Zen of contemplation- how can each tiny flower contain such perfection of design, of life? Each flower is a vehicle of life. The process begins with appreciation. Appreciation begins in the details of one diminutive flower. Which one should we choose? All. The barren serpentine soils common to California support a fairyland vegetation of minute detail and intense color; a sparse and diminutive world that takes on a surreal life of its own- far from our typical conception of beauty. Taken in on a large scale they appear sparse and barren. It is only when one engages in the miniature that the intricate and intensely detailed world comes alive and the brush strokes of the painting stand out in detail. Gray, stiff grasses tear the landscape of fairyland flowers between blackened, grim rocks under the pool of palest blue sky- . What is more real? – the hardness of the rocks, the stiffness of the grasses, or the flowers spilled from the sun? If one walks up the hillside- the shape and species of the grasses (Festuca californica) soften the miniaturized (scrub oaks) oaks, and are broken by sudden explosions of crimson fritillaries, arresting under the pale sky. Mauve native onions explode from the rocks- denizens of the worlds of complete summer barrenness. Ceanothus cuneatus is pyramidal from generations of deer browse, yet intensely fragrant, the harshness of its miniature oak leaves in complete contrast with the sweet perfume of its flowers. Oaks, deprived of height and stature still speak with significance; their dwarf forms twisted by the environment speak with emphasis and are cloaked in thick cloaks of moss. They are there long beyond generations of man. Last modified on 2011-03-25 01:37:33 GMT. 0 comments. Top. Pigs in the woodwork, sprinkles of wildflowers and doggies in need of a complete laundering. Delicate eyelashes of green leaves suspended on dark, glistening stems among murmurs of sun in the incessant rain. This day, March 24 snow again graces the dark hills while the river overflows its banks in the valley near our house. It is still time for cardigans and wool scarves. Yet, spring it is: shooting stars, Indian warriors, Western hounds tongue, saxifrages, lomatiums, Tritelias, butter and eggs, nemophila, ceanothus, manzanita, willow and oso berry reject our idea that it is still winter and invite bumble bees and small native bees to visit during the briefest glimpse of sun, signaling that life is surging around us while we huddle inside. Spring walks are still journeys of discovery with wild flowers sprinkled sparingly among grasses- needing discovery, not visible at a distance. They appear as from nowhere from day to day- one day just a scene of grasses- but the next woven with delicate spring flowers. The new leaves of buckeye, creek dogwood, ash and the brilliant chartruese yellow of the willow blooms contrast with dark almost black branches of dormant oaks festooned with pale gray lichen. The scene appears ancient and new at the same time and pushes and pulls ones emotions up and down from introspection to the beginnings of spring joy. 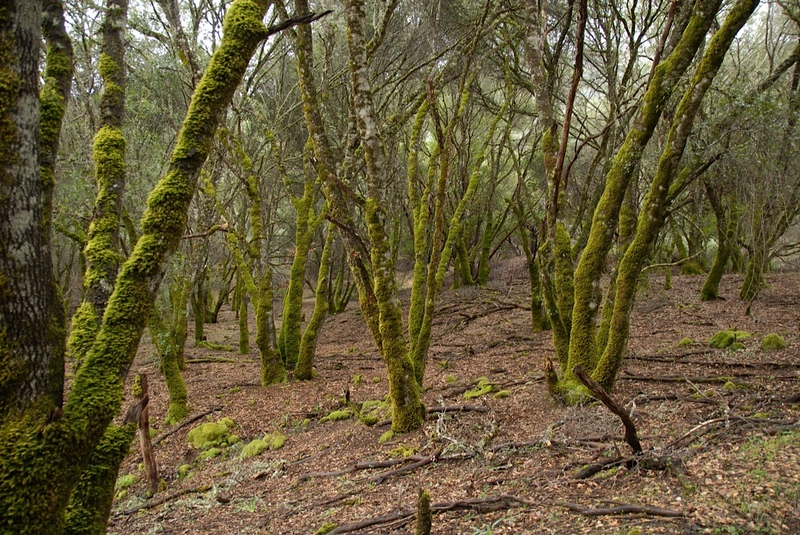 Some of my favorite winter/spring scenes are the nearby hillsides of dormant, black oaks draped on the north side with thick carpets of soft, emerald moss. The bark glistens black with white flecks, and the ground underneath is carpeted with short grass and forbs. It is a mythical scene of stillness and contemplation, of looking deep within, and where the rest of the world drops away- vanished. The tree trunks are like swift, black strokes of a Japanese brush against the matt grasses, but draped with brilliant moss like treasured steeds. Among these scenes rampage the wild pigs, churning the turf of new grasses into mud, changing a quickening landscape into desolation in endless quests for food. Their rooting is everywhere- under oaks, all around the newt pond, in the native grass and wildflower fields. We rarely see them on our walks, and they must wait for darkness to begin their campaign of destruction much like dictators everywhere. 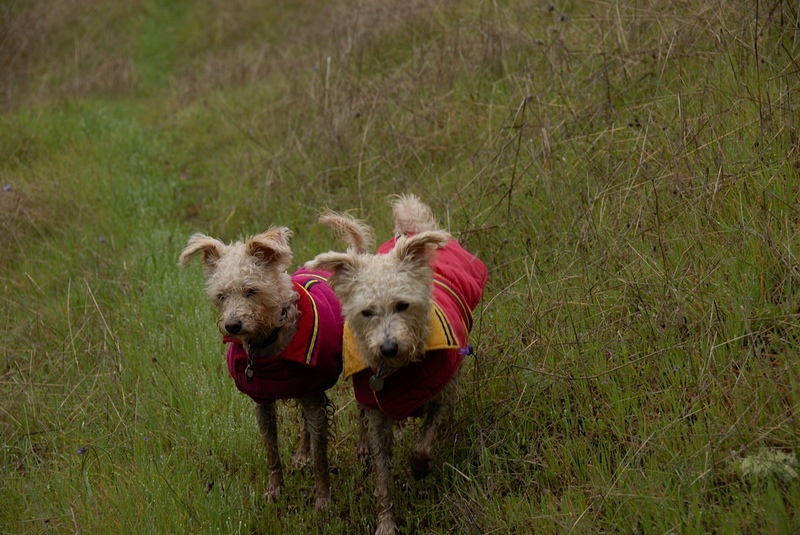 We can see their hiding places but the dogs are on high alert each time we go out, and scared up a huge, ugly Russian boar that leapt across the road in front of us in a silent instant and disappeared into the scrub. The dogs stopped at our feet, obviously taken aback by what their fantasies had conjured up. They had to be taken home for a complete laundering. Last modified on 2011-03-17 22:41:07 GMT. 0 comments. Top. 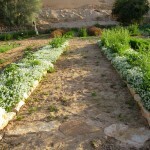 The morning of the Prince’s party I gave a class to 6 ladies interested in growing organic vegetables and flowers. We looked at and tasted the insurrection of vegetables- purple and Romanesco broccoli, rainbow chard, purple and red carrots , gargantuan orange/red tomatoes, the likes of which have never been seen in the Kingdom before, the vast array of greens, snow peas, Japanese vegetables and all other edibles, and discussed the seasonality and practical aspect of growing them in Riyadh. 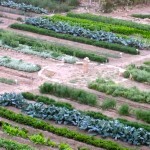 Compost and fertilizer use, drip irrigation, and creating an environment with a natural balance of pests and predatory insects , and planting veggies in pots were also covered. Some people have ground to work with- others just pots. I had located a single lacewing egg on the large Calotropis procrea bush, a toxic shrub in the milkweed family that resembles a giant milkweed in a dream-world, that was surprisingly covered in the same orange oleander aphids that milkweeds often have here in late summer. It was partially defoliated by them, and on the underside of one of the remaining leaves, I found a single lacewing egg that I showed to the ladies. I had found a couple other lacewing eggs earlier on the Zizyphus tree, and wonder whether it is the beginning of the season for lacewings or there are few of them. Both the orange aphids and the lacewing eggs are examples of the evidence of how closely our worlds are connected. 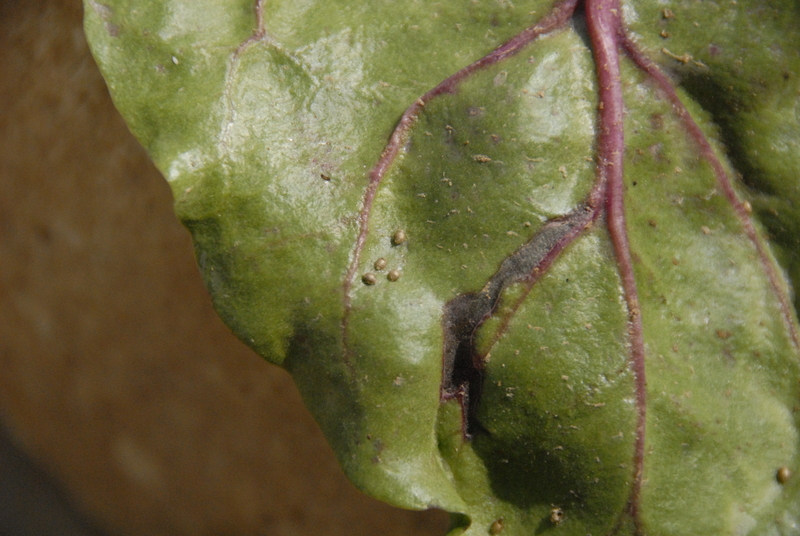 I also showed aphid mummies on the chard to explain that a healthy garden should have a balance of pest and predatory insects in a balance, and this was evidence of it. We examined the many insects hovering around the alyssum to illustrate flowers that support predatory insects with pollen and nectar. The groups main concern was washing the aphid mummies off the leaves before eating them. 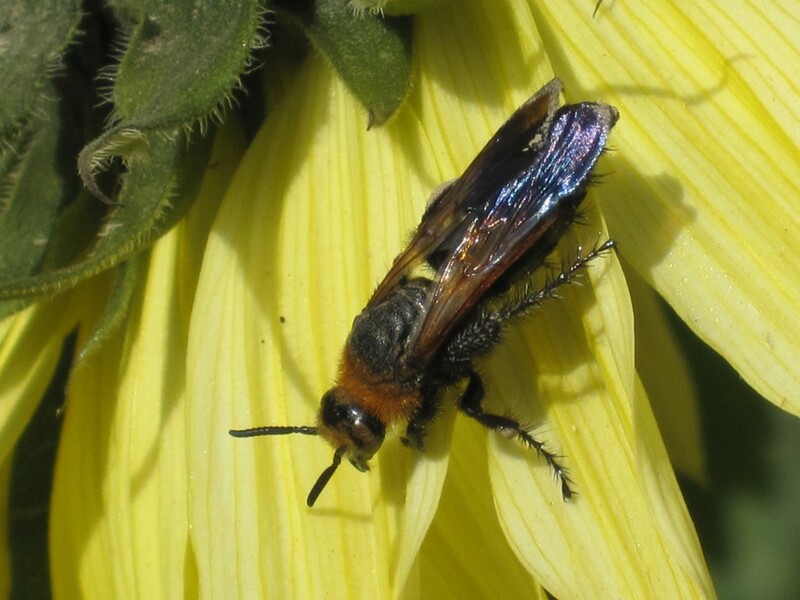 Creating a garden that strives to resemble- on a small level- an ecosystem- is a new concept here- and planting flowers that cater to predatory insects with pollen and nectar resources is a new language that will take some time to engage. Afterwards, the Prince had a grand party catered by his Egyptian friend Balbek, who has the wonderful Balbek’s Lebanese restaurant. A number of ambassadors were invited and their bodyguards stopped by the farm early to check it out. 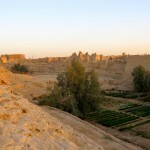 The Prince had engaged a couple of ladies to make traditional foods, and there were many appetizers, main courses of lamb, rice, vegetables, salads and tiny goodies of pistachios, honey, nuts, dates of various types, and fruit drinks and sodas in abundance. The Prince made sure the bodyguards and all the workers were fed and personally brought around the desert trays. That is the kind of person he is. 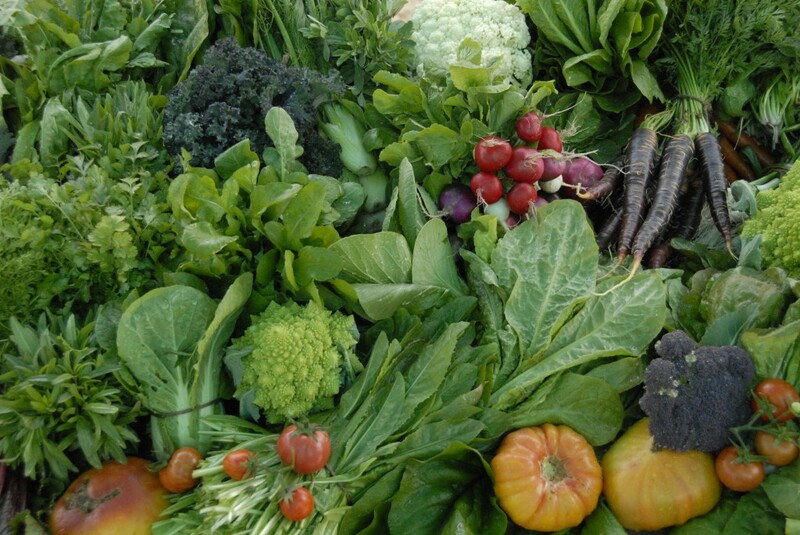 He also announced that some of the vegetables grown on the farm were from the Japanese ambassador, and issued an invitation to the other Ambassadors to please bring him any vegetable seeds from their countries to have us grow. We got a new assortment of Japanese seeds from the ambassador and have planted Shiso in the greenhouse and an assortment of pac chois, green onions, Japanese parsley, braising greens, cress, lettuce and tat choi. 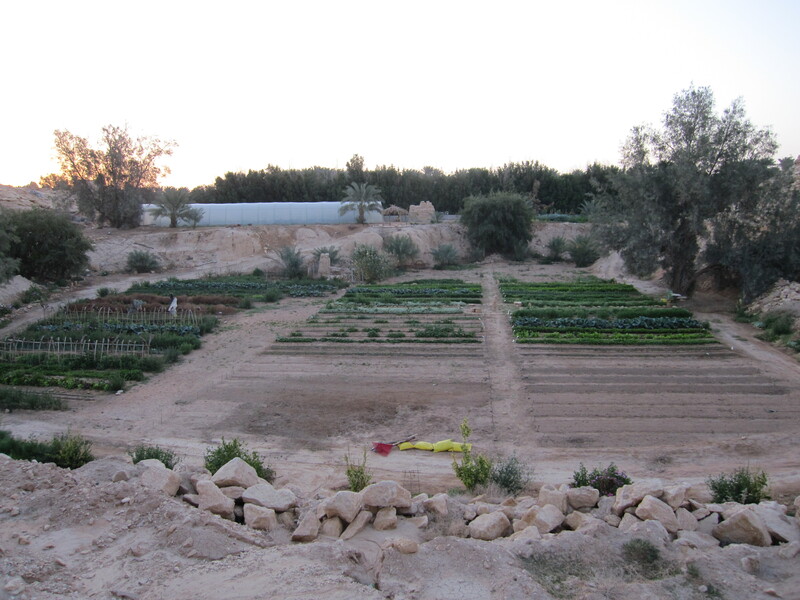 Japanese vegetables grow beautifully in the desert sands- at least so far. Other guests were business people from many countries, lawyers, and a couple fellows from the Mideast Policy Institute, who were in the Middle East fundraising. 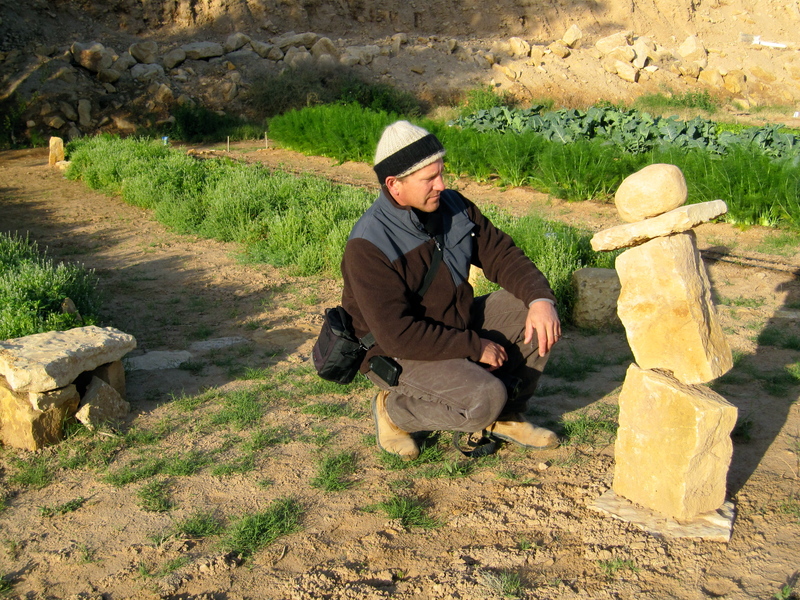 Among the guests was a PhD from Germany with the German Technical Organization who is directing the efforts of the Saudi Organic Farming Association. 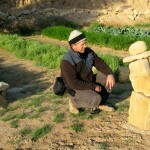 His efforts and accomplishments have been to him- slow, but looked at in perspective- from starting from zero, with a large group of people who have differing opinions and a new awareness of creating an organic focused organization and standards, the structure of education and organic standards accomplished is huge. He is very obviously committed to the project. We also invited Dr. Hassan to the party, who is the manager of recycling from Al Khaledia farm, one of the finest farms in the Kingdom, and owned by the defense minister. He is the compost and animal feed king there, and converted the tremendous amount of green waste they generate into very high quality compost, fertilizer and sheep food. We use this precious stuff at the farm and couldn’t continue without it. 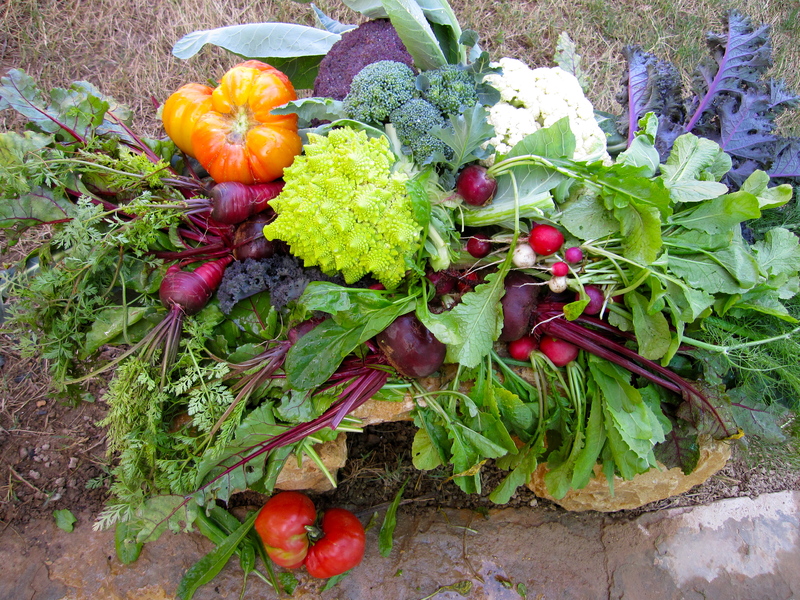 We harvested a mountain of vegetables for people to bring home, and Ben was kept busy bringing food to the bodyguards and helping the ladies carry their coveted veggies to their cars. The farm really came into micro-focus for us this trip. Besides the several lacewing eggs we found, I saw several wolf-type spiders and a rove-type beetle. In addition there were some mouse babies in one of the beds. I realized now what the foxes that live in the rocks were doing digging all over the garden at night- mouse hunting! We thought they were just being destructive and owe them an apology. The place is perfect mouse habitat- plenty of food and shelter, even water. The place could be over-run with them. I planted a lot more flowers including sunflowers for bees, beauty and the green parrots who love to eat the flowers- and whose brilliant green plumage colors are so decorative against the yellows of the sunflower blooms- a painting on the wing. 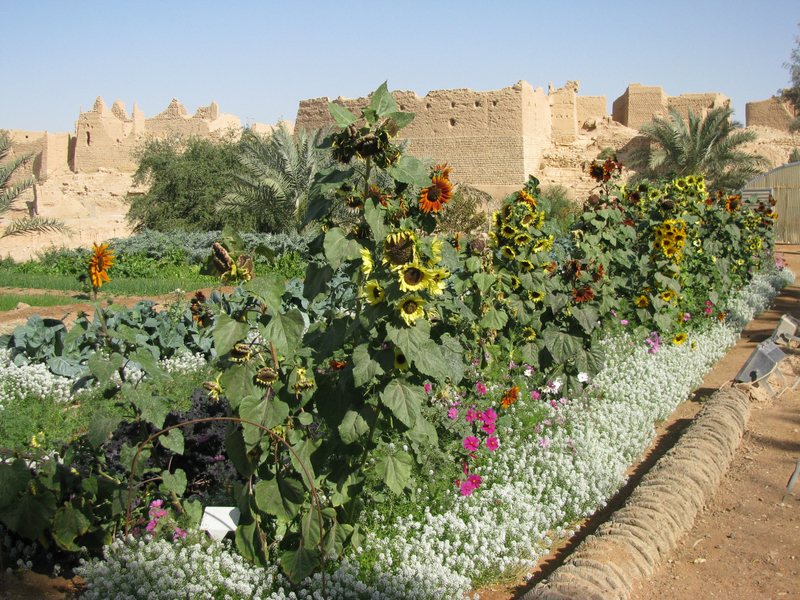 Little does everyone know that the farm will burst forth with waving color and insect habitat under the intense Saudi sky- an insurrection of petals, pollen and nectar. 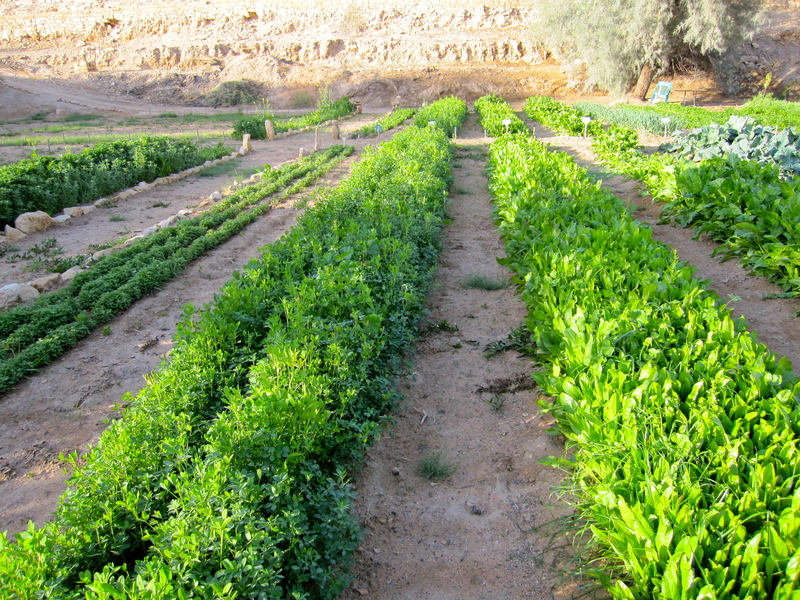 Al Khaledia Farm is a mecca for diversity. 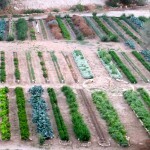 It has 35 hectares of organic greenhouse with peppers, melons, tomatoes, cucumbers and other high value crops. 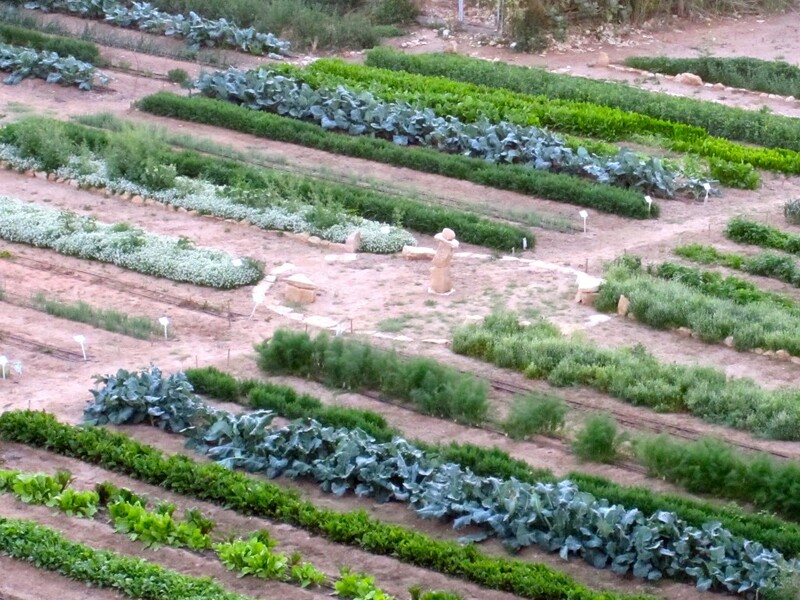 Outside, for the prince, there is a number of acres of vegetables- lettuce, onions, garlic, fava beans, salad greens of all kinds, cabbage, broccoli, cauliflower, coriander, wheat, and in greenhouses- beans, peppers and a forest of eggplants. There are also date palms, citrus, table grapes, olives, a wildflower meadow, a gazelle and onyx preservation area, sheep, 700 Arabian horses and 100 hectares of compost and fertilizer facilities, besides extensive landscaping. 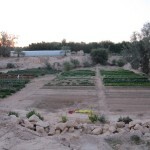 The veggies were grown in flood-irrigated plots and also with drip- the drip line and veggies being planted in furrows- instead of on the top of furrows. 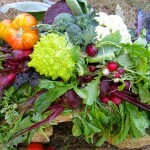 In addition the cauliflower and broccoli were planted really deep so they would root on the whole stem like tomatoes. The bean greenhouse looked like a bean fairyland with delicate leaves floating in the air as lovely as embroidered air, and the eggplants created a glorious eggplant forest well over our heads in height and dangling with deep purple, glossy fruits. They live 1.5 years. We saw some of the Arabian horses- the best in the world glossy and sleek in deeply bedded stalls and out on grass their foals beside them. 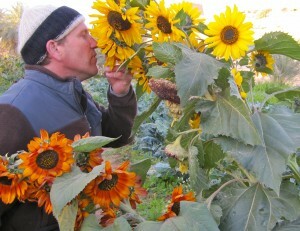 What was most interesting was the extensive composting operation and the wildflower meadow. The compost is made from all the green waste on the farm and is segregated into what is suitable for animal feed and for compost. 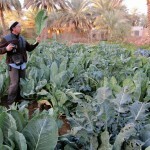 There is also fertilizer made from the quail and sheep manure. Dr Hassan has a system where he inoculates the windrows with a bioactivator of bacteria and enzymes, waters it once a week, and turns it several times. It is ready in 6 weeks. He also has larger piles he doesn’t turn and they are ready in 6 weeks as well. 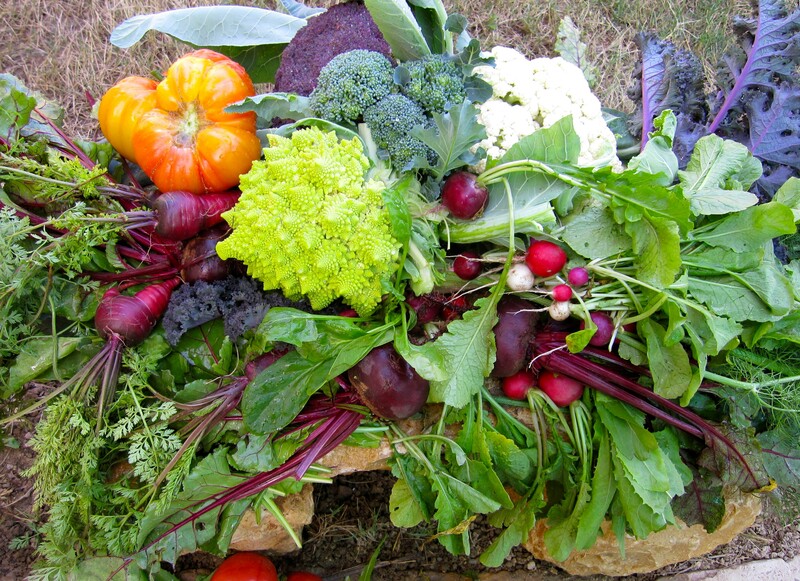 All the nutrient levels are higher in the compost made using the bioactivator. 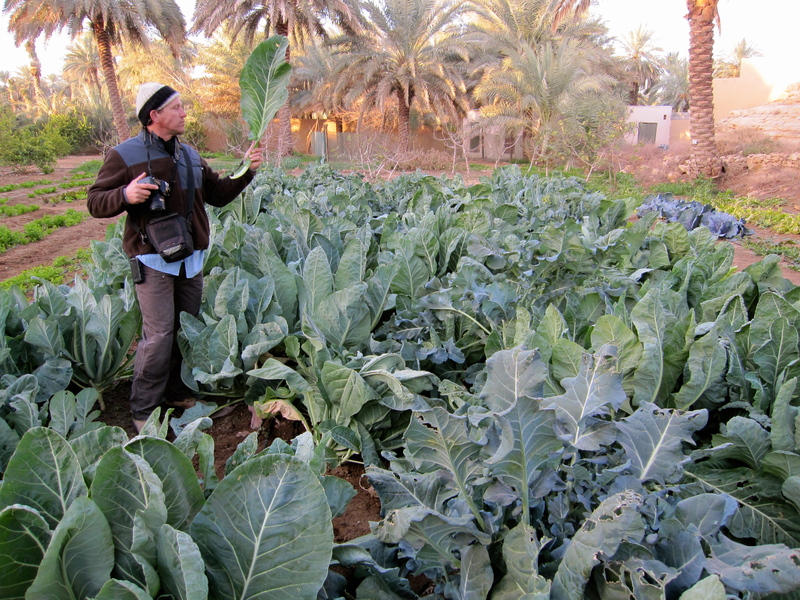 He has also done a lot of research on the different farm waste and its nutrient levels, palatability and its potential to put weight on the livestock- even the palm, olive tree and citrus waste. He found they can supplement the alfalfa and grain feed 40% with green waste and get a better rate of gain than with grain and alfalfa alone. To us, the most exciting aspect of the visit, besides a delicious lunch, was a 35-hectare wildflower meadow that we had seen when just planted last year. 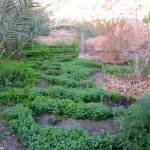 It was seeded with a seed blend of non-native alyssum, Gaillardia, Linaria, and Oenothera berlanderi. They were together gorgeous, red and white gems against the desert sands. 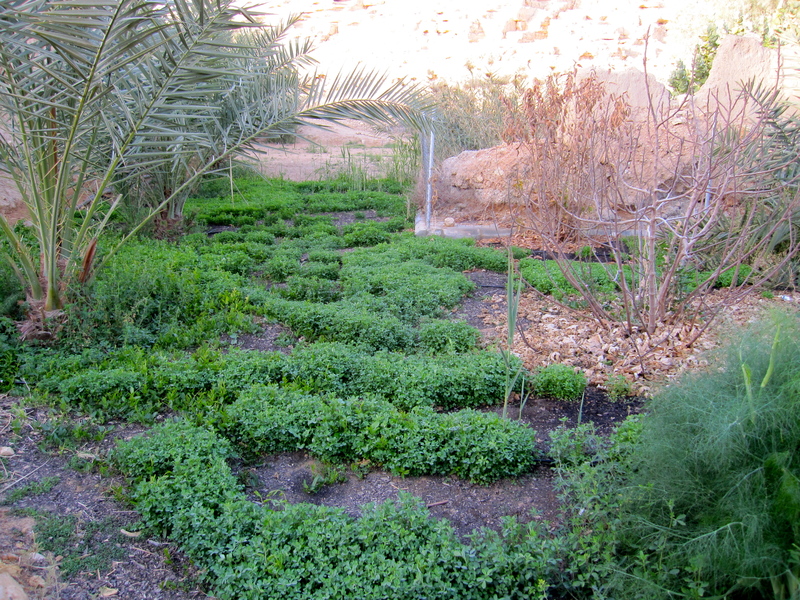 But what were most exciting were the native desert plants that came up with the addition of water. Annual legumes, plantain, grasses and halophytes sprang up in profusion, their seeds having been dormant for possibly years waiting for moisture. They were Salsola, Alhaggi maurorum and the grass Panicum turgitum, a plantain, Cyperus conglomeratus, Rumex vesicarius, Heliotropum crispum, all very important for sand stabilization, grazing and seeds for birds. The contrast between the meadow and the bare sands surrounding it was astounding, and the amount of birds that were in the meadow was amazing. We saw a number of bird scrapes- nests of ground nesting birds that were evidently occupied. The meadow was irrigated two times a week for 1 hour, and I think not at all after March. We didn’t know whether there was nesting success with the disturbance irrigation involved. It was far too windy to look for insect life on the day we were there. No bees were in immediate evidence. We will have to try and come back. 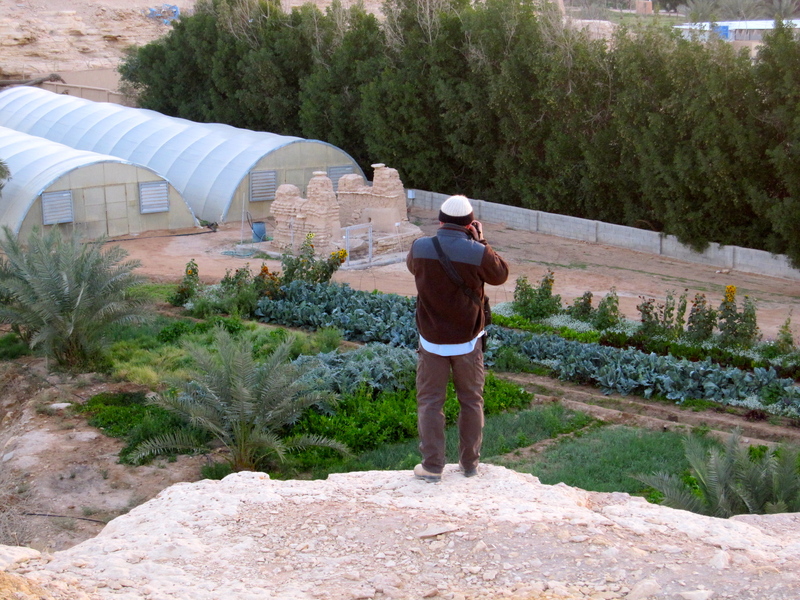 To see the farm with its rich diversity of crops and interests: organic greenhouses, outdoor vegetables, table grapes, olives, wildflower meadow, palms, citrus, nursery, landscaping, horses, quail, sheep composting, wildlife preservation area with rare and endangered gazelle and onyx is to see the workings of a very creative mind on the bare desert sands of Saudi Arabia. When the Prince first began the farm in the 1980’s it was bare- now it is a universe unto itself made up many small worlds of endeavor and interest. I am now home in cold, green California where life feels strangely flat after the minute interest of life in Saudi Arabia, where each day brings surprises and epiphanies beyond current realization- and yes- the everlasting pursuit of the Hoopoe. Last modified on 2011-03-17 22:43:38 GMT. 0 comments. Top. Young, old, bespectacled, clear eyed, lawyers that taught university English from America, German linguists who taught university English, urology nurses from Australia, telecom workers from Australia, water system evaluators from Russia, army and air force personnel from the US, pharmacy students from Jamaica, nurses from Finland, all of these folks and many more- almost 200 strong, scrabbled and scrambled down the wadi past the dead yellow taxi, and disappeared into its depths on a desert walk. 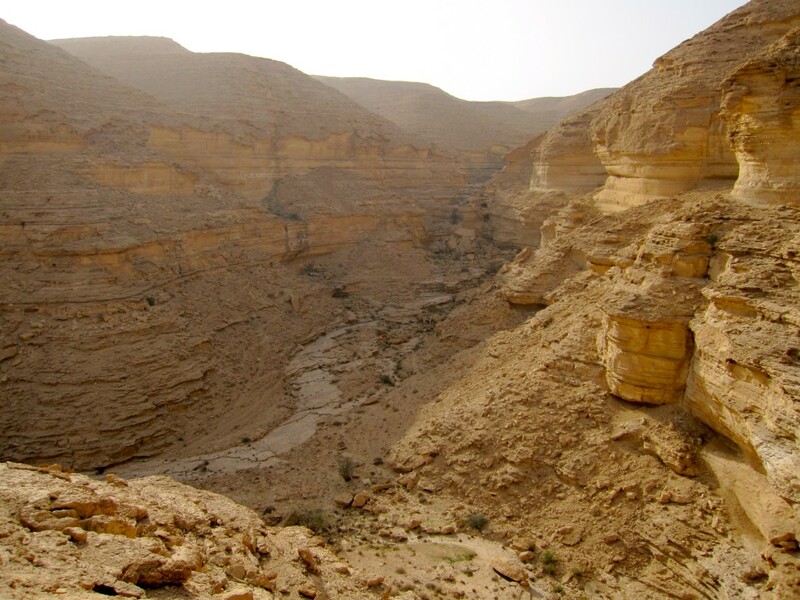 We met on a moonscape littered with fossils from under the sea and sprinkled with black rocks like chunks of petrified licorice- on a windy bluff overlooking the depths of the wadi and the dead yellow taxi that was lodged in its uppermost jaws. We went with our friend John, The Irish banker and thought we would hang out and chat while we waited for the other folks to arrive. Our chairs blew over as soon as we set them up outside the van so we retreated over the edge of the wadi to get protection from the buffeting, incessant, drying wind. 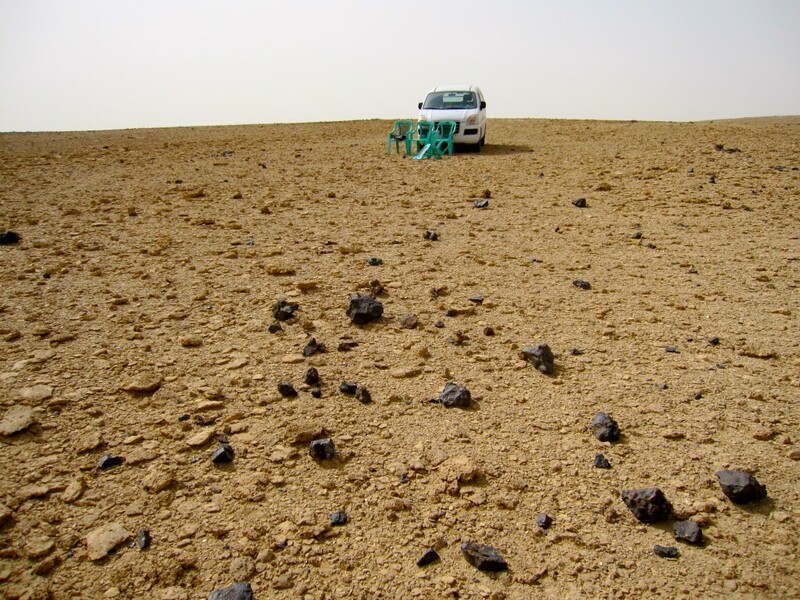 The main color of the landscape was taupe and was littered with rocks that had the texture of baked bubbled mud, and felt like they would tinkle under our feet except it was impossible to hear anything because of the roaring wind. The black rocks were all on the surface and were much lighter than the taupe ones. Who knows what part of the sea floor lost in the millennium of time they represented? If one believed in the apocalypse the scene would have been reassuring. With the last person of the convoy over the washed out gullies of the dirt road, followed an ancient beat up ice cream truck driven by an Indian fellow. Despite the cold, driving wind a long line ensued and ice cream eaters abounded. I unfortunately had a half-finished cone in my mouth as I slithered down the scree slope and almost choked, a pastime not recommended. The trail is marked by blobs of white flour and our blobs went down a precipitous, arid scree slope decorated by fossilized coral and other sea creatures over 240 million years old (we are told). We followed the water washed and polished stone floor of the wadi where small pools of water had collected from the recent rain, though all else was dusty and dry. Acacias, whose delicate ferny leaves obscured vicious thorns, were placed at perfect design aspects, with small perennials in the radish family with delicate lavender flowers and massive thorns, decorated the ground here and there. Various Grand Canyonesque aspects opened up, and dry cascading waterfalls whose contents of air plummeted in frothing white torrents to the depths below. We scrambled and climbed down steep slopes, rock ledges, boulders, in undignified and awkward positions the 200 of us, young, old, portly, svelt, out of shape, in shape, huffing and groaning and puffing in a very long straggling line of immense enjoyment. Last modified on 2011-03-17 22:45:42 GMT. 0 comments. Top. The golden night, mysteries in the greenhouse, dancing with gastroenterologists and bulbuls in the rear view mirror. Two nights ago it rained. First the wind came up blowing dust in front of it, obscuring the sky. Under this cover, clouds quietly assembled until at 7:00 pm, thunder announced the storms presence and lightning lit the darkened sky, illuminating the jagged leaves of the palms. 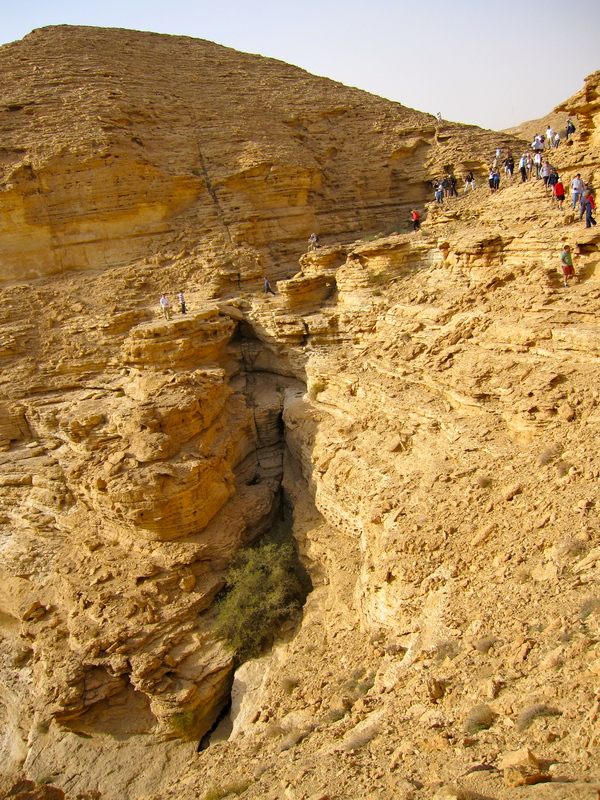 Lightning and thunder continued for an hour- strike after strike down the wadi. Like the rain that fell- huge wet drops, that felt like they would soak you- but didn’t quite. The thunder and lightning were similarly just out of reach down the wadi among the palms and not overhead but absolutely dramatic nonetheless. With the storm came a golden night. 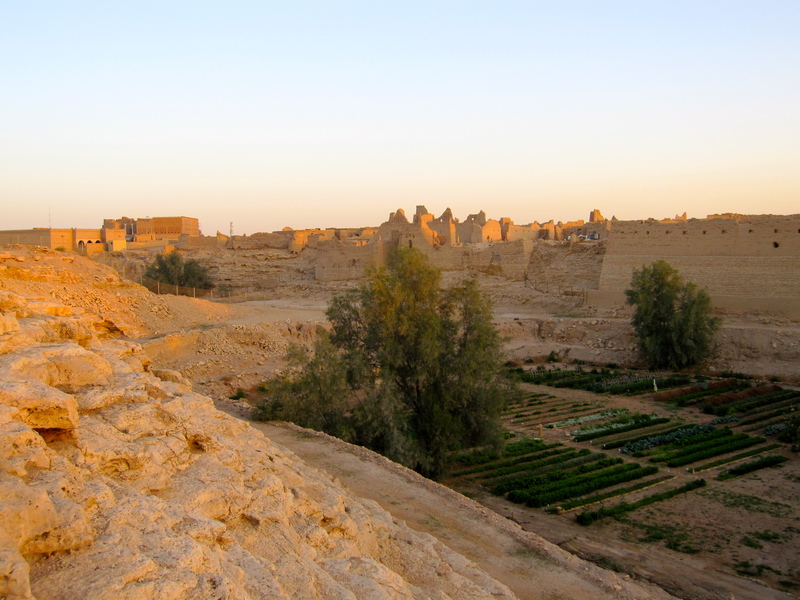 The soft contours of the limestone bluff, the road, the eroded slopes, the crumbling ruins of Diriyah, were gold and it was so light one could have worked in it- no problem. The world was bathed in heavenly light. It was not cold and we walked around the farm in our pajamas with the raindrops. The rain cleaned the sky which was sparkling clean the next day, but deposited its dirt on the plants. 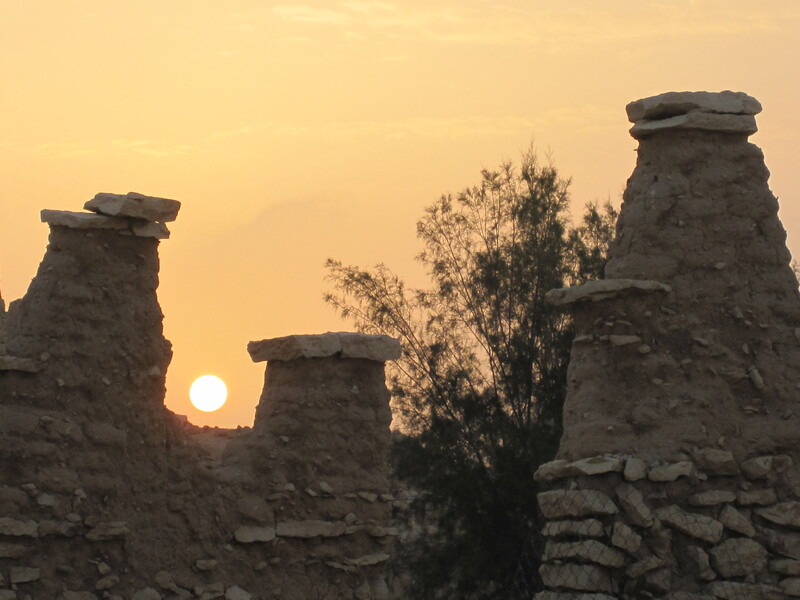 Such is life on the Arabian peninsula in the desert. One cannot have everything. The greenhouse was full of problems. 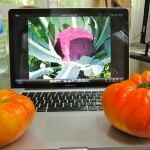 In one greenhouse sections of the tomatoes were stunted, others were diseased. 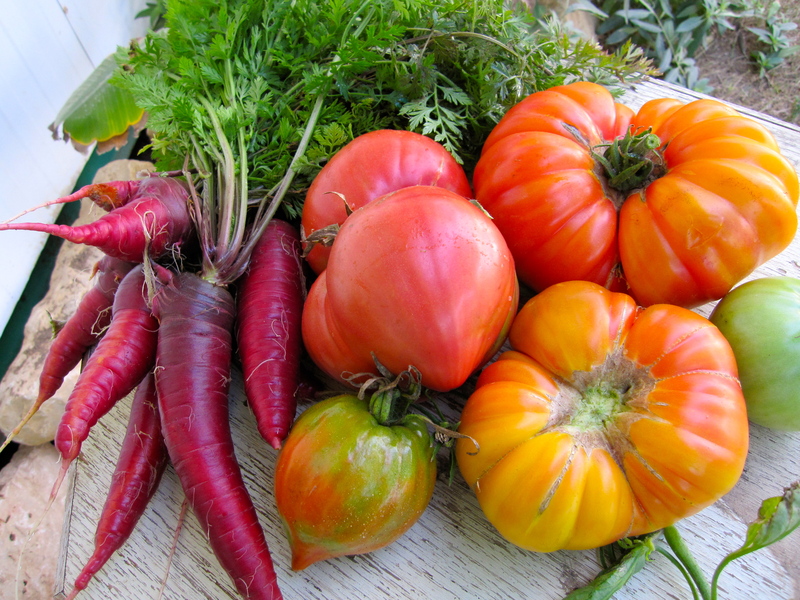 I initially imagined that the discrepancies in height and vigor were all due to diseases like Early Blight and Tomato yellow Curly Leaf Virus. The workers had obviously not pulled out the diseased plants, nor pruned off the diseased leaves to keep levels of the Early Blight fungus down. 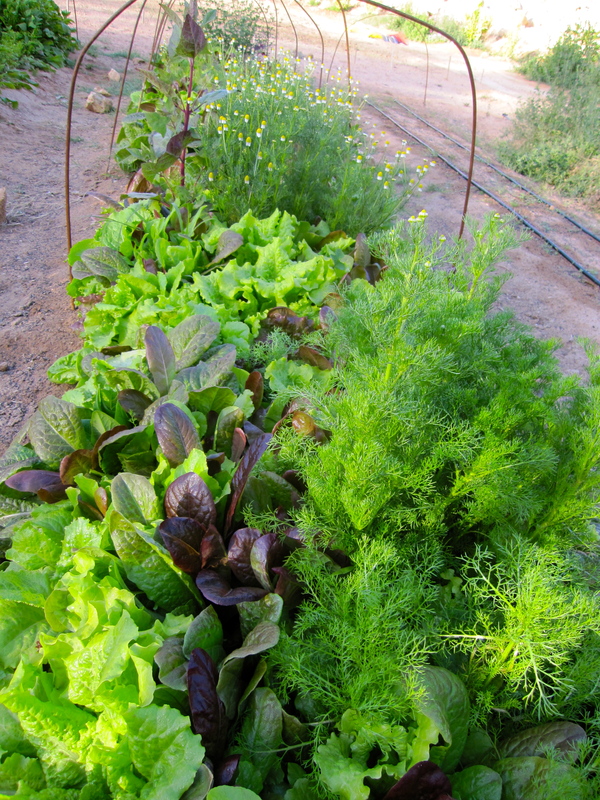 But, when I started pulling out plants, I noticed that the soil, while wet on the surface, was dry underneath. Looking further I realized the drip tape was not pressure compensating and the water was accumulating at the end of the bed, where the plants were big and healthy. 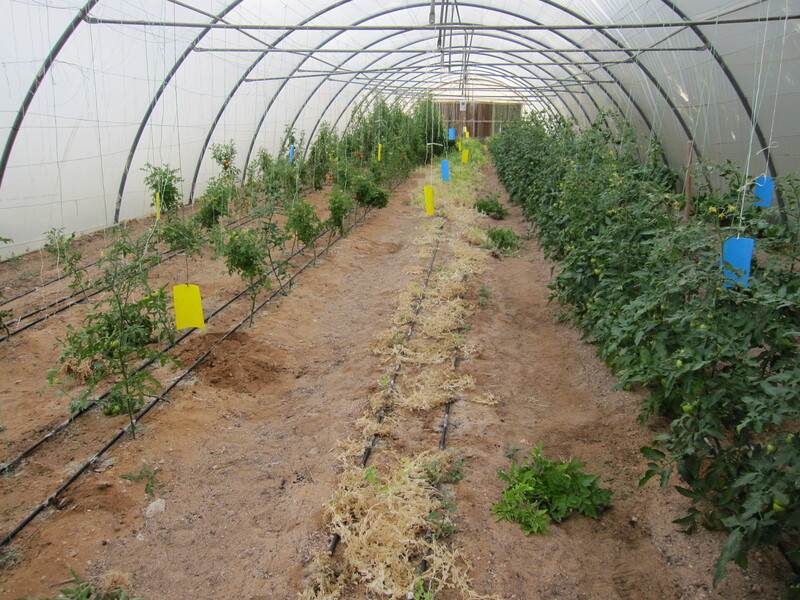 Further investigation showed that about half the plants had root knot nematodes, eroding their ability to take up water and nutrients and predisposing them to diseases and pests. In the other greenhouse, the soil was wet and the plants were very healthy. We are working on instructing the fellows- (is this possible?) in crop rotation to help diminish the nematode problem and are replacing the drip tape with new- PC of course. The farm is full of mysteries like this. Another was- why are some beds of potatoes dying in the lower garden? Was it frost, as it appeared to be? 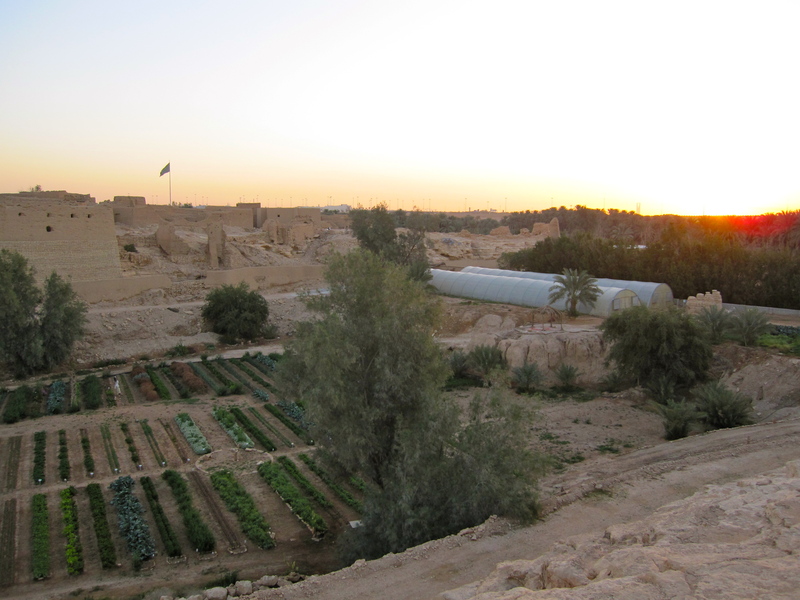 We tried to solve this problem from home and couldn’t but as soon as we arrived I realized That the white potatoes (origin China) from the market in Diriyah were dead and the others (origin Egypt) , from the Tamimi market were healthy. Cause- disease. We hope the disease is not now transplanted on the farm. Last night a friend invited us to the gala buffet for an international meeting of gastroenterologists that she worked to organize. It was held in a huge hall at the al Faiselia hotel where I had given a talk last year. The evening began with traditional Saudi dancing and singing with a rababa. The docs were encouraged to get on the stage and dance with the Saudi dancers and were each given swords. Mr Benjamin Frey joined them with a sword of his own. Can you imagine a more dangerous experience than dancing with gastroenterologists with swords? We met one from San Francisco- a Dr. Emit Keith, one of the main speakers. If anyone is looking for a good Dr. this is a recommendation. We discovered among other things that there is now a Saudi journal of gastroenterology that took quite a bit of effort to establish. The bulbuls- my favorite birds- to be precise, the yellow-vented bulbuls, are courting. A deeply in love pair was sitting on the truck door, feeding each other a tidbit of tomato and fluffing up and preening in the most self satisfied way. They were both sitting where they could see themselves- or 2 other birds in their minds- and the male would fly at it frequently while his lovely wife would chitter and fluff with adoring approval. 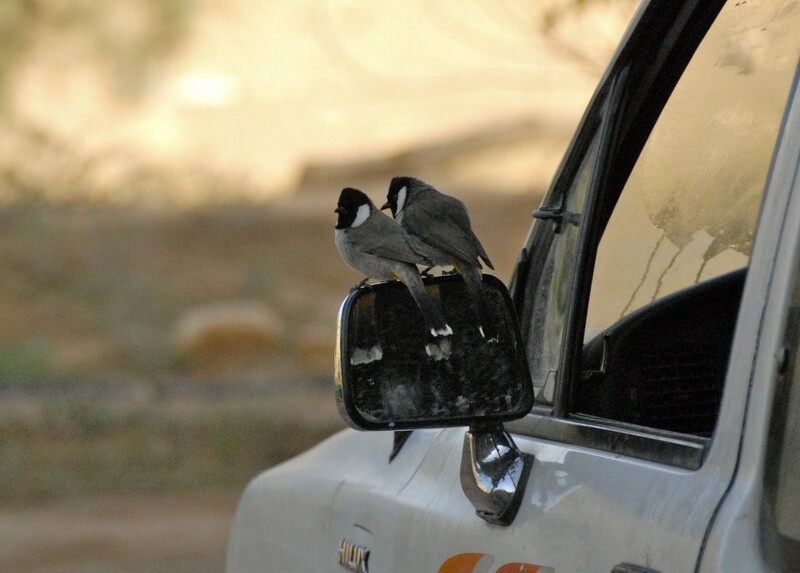 They would fly to the top of the mirror and perch and fluff and preen each other and kiss as if they had conquered the barbaric invaders below them. 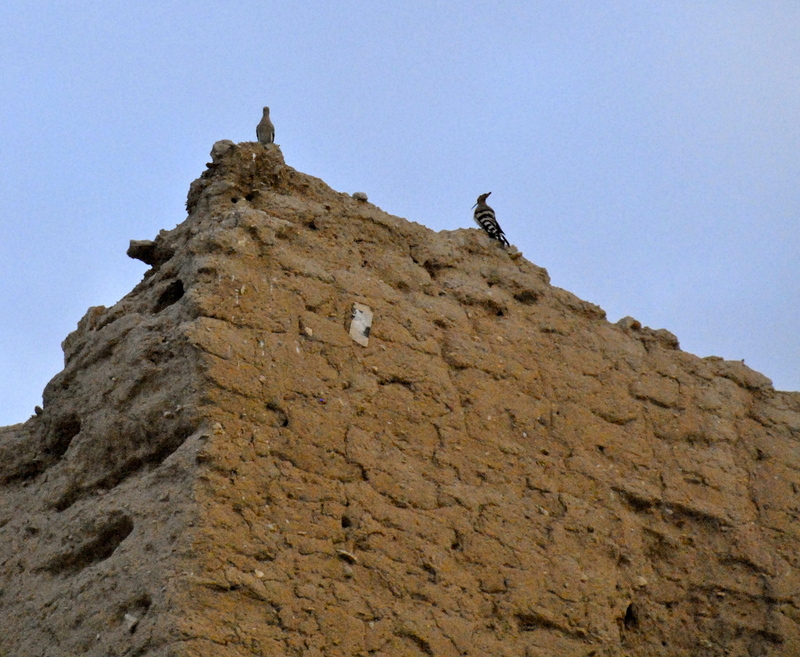 The swallows arrived today and flew high above the ruins of Diriyah. Last modified on 2011-03-17 22:46:45 GMT. 0 comments. Top. Feb 8: Eagles and Hoopoes at dawn and scrimishes in the garden, and vegetables for the Swedish Ambassador. This morning at 6:30am, otherwise known as dawn- Ben was down in the lower quarry area of the garden contemplating the tasks of the day by himself as the fellows had not shown up as requested at that early hour. 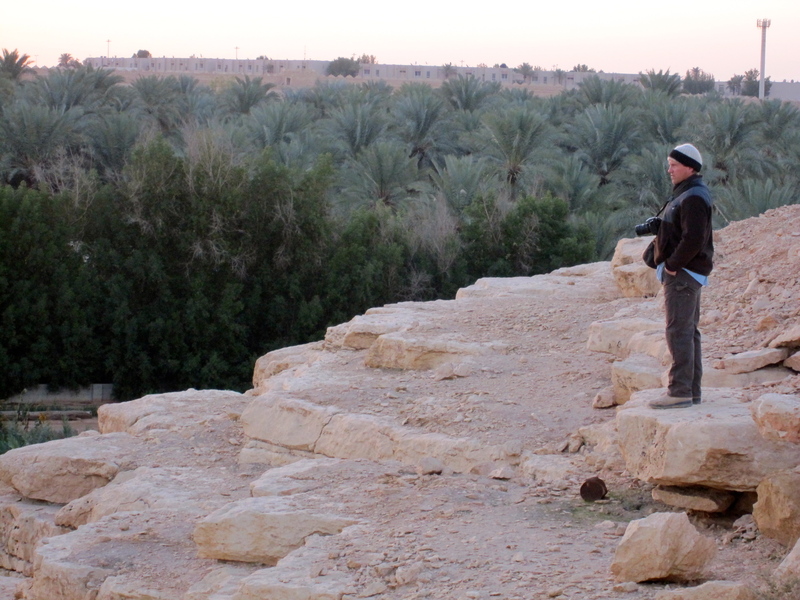 As he contemplated he realized he was being contemplated by a huge black eagle on the top of the ruined fortress above, like one of the al Saud warriors of old returned. After a few minutes it flew off with 4-5 foot wingspan. 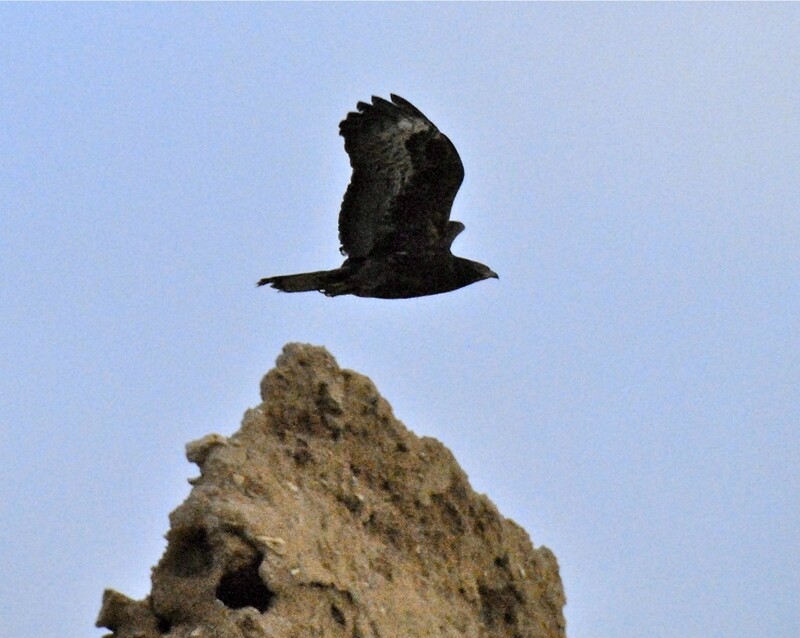 We think it was a Lesser Spotted Eagle, a common eagle in the Middle East, but fantastic to us. After a few minutes, 3 Hoopoes came and sat in exactly the same place the eagle was. Their long beaks, spots and crests are like a Dr Suess creature- incongruous on the ruined mud fortress. So began the day with a contrast of stern and comical and so the day went forth in spasms of sterness and comicality. The fellows showed up at 7:00 and when Ben asked them why they were late, one of them immediately blew up and much words were said that much reduced mean telling someone off. Ben sent him home. After two hours he came back with tears and a hug and apologized to Ben. This is after the other one doing the basically the same thing minus tears and a hug after being asked to deviate from their self imposed work schedule of starting at 8:30, breaking at 9:00 for ½ hr for breakfast, and lunch at 11:30 until 2:30, prayer break at 3:00 for half hour and finish at 9:00 or earlier. It is unfortunate we don’t have crests to raise on our heads like the hoopoe bird. 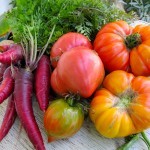 We have planted 10 beds with beets, carrots, Japanese greens, arugula, radish, beans, eggplant, celery, alyssum, sunflowers, 4-o’clocks, orange cosmos and purple cleome. I’ve done a lot of weeding of very large weeds that were left from the time of Ben’s departure in Dec. We keep emphasizing prevention rather than reaction and that is it is easier to get the weeds before they go to seed, rather than let them go to seed and have more and more weeds which is what has happened forever and ever……. We harvested 3 huge quantities of vegetables today- 1 for the Prince, 1 for the Swedish ambassador, and another for a very nice friend of the Prince’s who had me to her house for a delicious cake and visit to her garden. 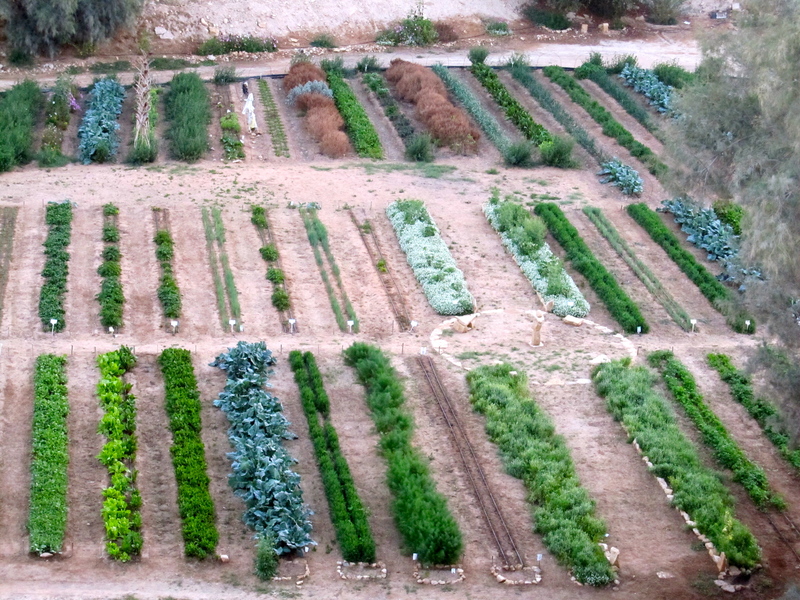 The array of vegetables that farm contains is amazing . A list will follow in the near future. 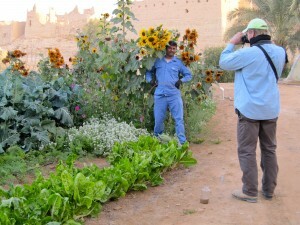 Yesterday we harvested an array of the best of everything for the Saudi Minister of Agriculture, who had kindly hosted us on his farm the year before. We selected the most colorful and brilliant items of course. 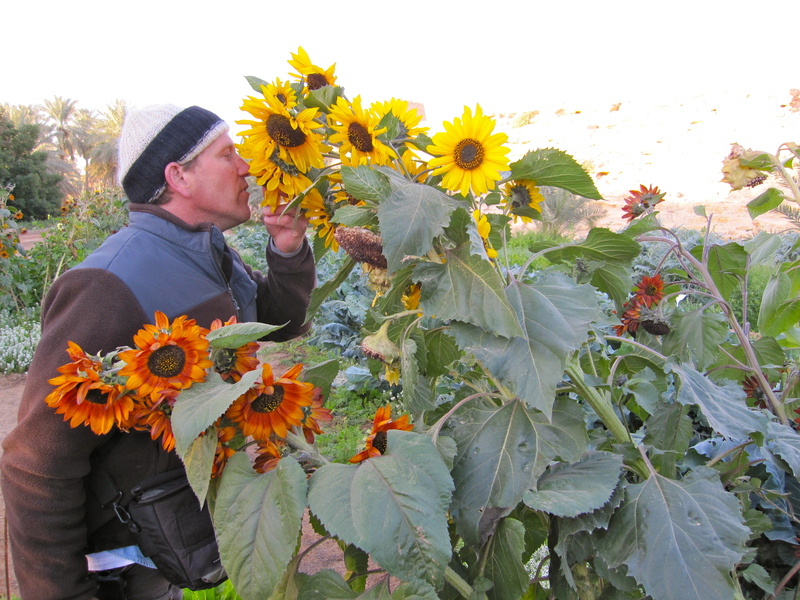 Green parrots have discovered the sunflowers and fly down the not just harvest the seeds but tear of portions of the entire flower and eat them. Sometimes that fly with large pieces up into the near by trees to eat them in peace- if that application can be applied to parrots. They are apparently non-native and are escapees just like wild parrots in San Francisco. When the sun shines through their plumage they are brilliant chartuese. The dragon flies came in numbers yesterday when we were all putting compost and fertilizer on the beds, perhaps attracted by the flies it drew. Several thousand of them flitted and flew around that end of the farm for over an hour obviously ferocious warriors on the wing. Last modified on 2011-03-17 22:47:55 GMT. 0 comments. Top. Aphid mummies, the victims of parasitoides are everywhere. Dinner is simmering on the stove after a monsoon of washing vegetables. With our camel are caramelized onions and findee, a bitter green that resembles dandelion. 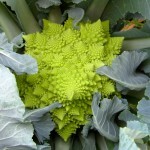 This is accompanied by the cosmic spirals of Romasesco broccoli with some grated cheddar and new potatoes. The expiration date for the camel meat on the package was written in Arabic. We can only hope it is good. It is dark, the curtains are drawn and the heat is on. We are both in our pajamas. 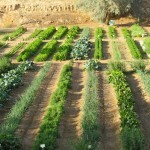 Our goal is to get the whole farm weeded and planted for summer which is approaching rapidly. Nights are about 50 degrees and days from 68- 76. And on these vegetables are more aphid mummies than I have ever seen. The tiny parasitic wasps that lay eggs in the aphids are in evidence everywhere. Sryphid flies are in squadrons over the alyssum and their larvae are also n the leaves. I found lacewing eggs in the zizyphus tree, and lots of ladybug larvae on the spinach. 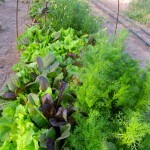 The farm is coming alive! 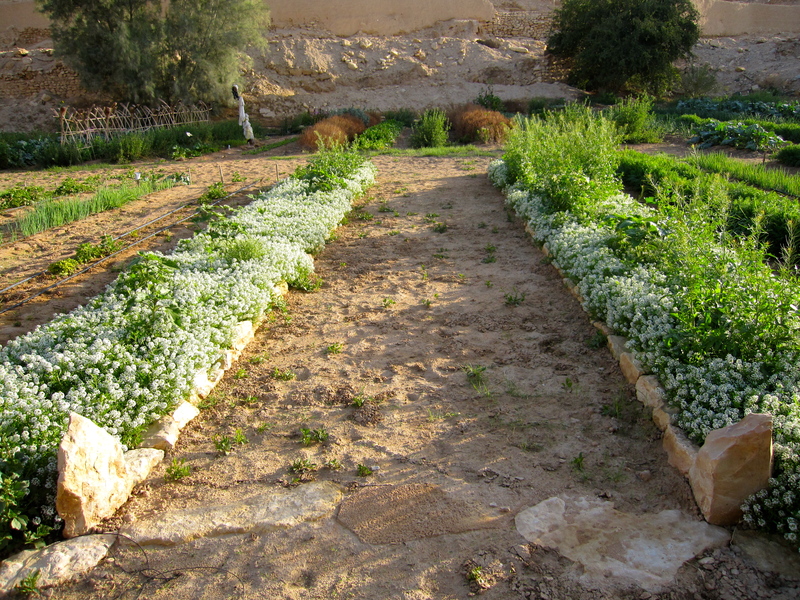 The beneficial insect blend is beginning to bloom: alfalfa, cress, alyssum so far. A number of flowers made it through the winter: pink and white cosmos, alyssum, calendula, amaranth, sunflower. I have lots to plant for the summer. The fellows were completely against the flowers when I planted them and had ripped them up during the summer. Now, they can’t get enough of them and frolic among them everyday and have to have their picture taken with them. I wonder if they have ever seen them before? The fellows are the farm are rebelling against our preferred work schedule. They start at 8:00 take a breakfast break at 9:00 for a half hour, lunch from 11:30-2:30, a prayer break for half hour at 3:00 and quit at 5:00 for prayer at 5:30. Ben would like them to actually work 8-9 hours a day while we are here. Tantrums were had and the Princes assistant Saed from Nigeria is coming tomorrow to talk to them. They were supposed to have a lot of beds ready for our visit but only 5 small ones were finished. Last modified on 2011-03-17 22:44:18 GMT. 0 comments. Top. Another jet lag early morning. 3am is feels good at 3 am but as the day goes on life begins to feel as thick as molasses until one finally just stops. At 5 am the variety and large number of birds are waking and singing so vigorously like the day was the first day of the planet. It must be nesting season as the doves are incessantly following each other around, the sparrows are investigating nests under the eves of the houses, and the bulbils are gathering. There was rain about 2 weeks ago and the dust of centuries is settled and now crunches under our feet. There are no delicate tracings to view in the dust each morning from the nights surreptitious wanderings. With the rain have come thousands of dragonflies hovering and zooming low and high over the plots of the farm and neighboring fields. Their numbers are noticeable from a distance and resemble flocks of fairies. How quickly they must have emerged with the 2 days of rain. Where were they all in their larval state? What body of water is there? the leaf- not the bottom which is usual here. 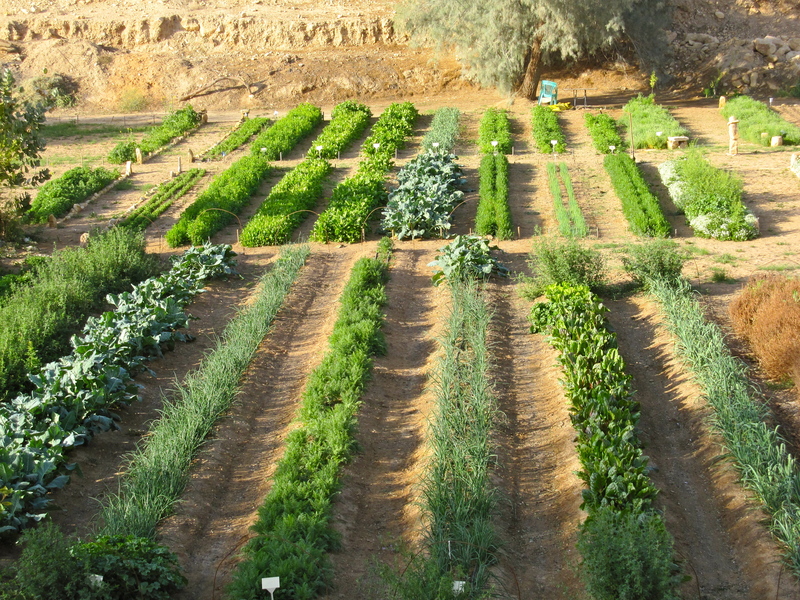 The farm is slowly coming alive, but the balance is so easily disturbed here with pressures of heat and little humidity besides few natural enemies and large amounts of virus and pests ever present in host plants. 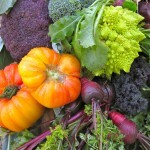 We brought the Prince some of the cosmic vegetables- purple broccoli, romanesco broccoli, magenta chard, redbor kale. 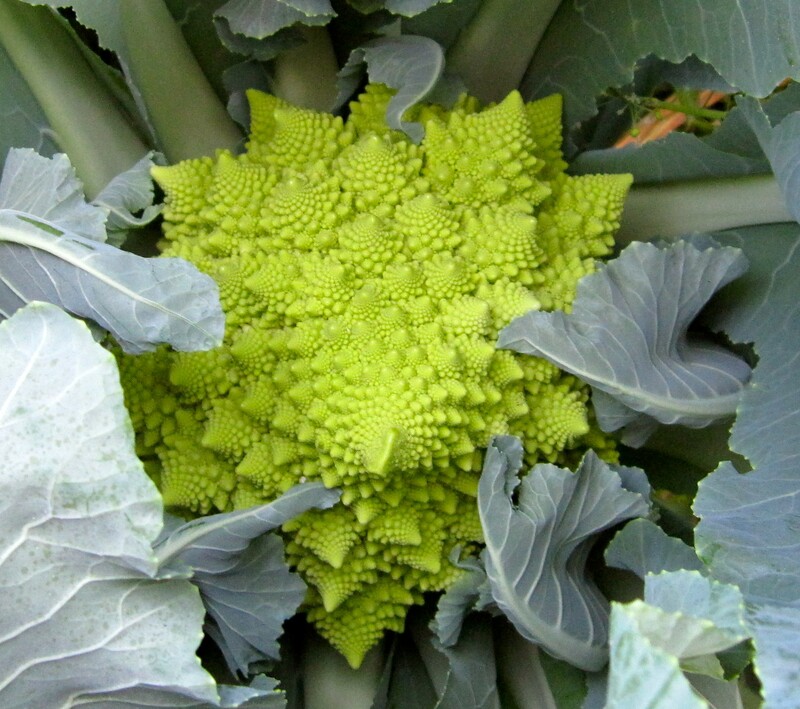 He and everyone was clearly boggled by the chartreuse spirals of the romanesco broccoli and had to touch them and wonder what are on earth they are. The farm is a happy place at the moment with all getting along and just minor discontents. The fellows still argue with us about everything. We shake our heads. We had a huge late lunch courtesy of the Prince at our favorite Lebanese restaurant followed by a whole plate of delicious date deserts and can hardly move. The days are about 78 degrees and the nights about 50. You can feel the heat beginning to build in the soil and rocks and reflected everywhere. The inevitable is waiting. If one closed ones eyes and equated the variety and number of bird songs, one would never know you were surrounded by thousands and thousands of miles of completely inhospitable country. 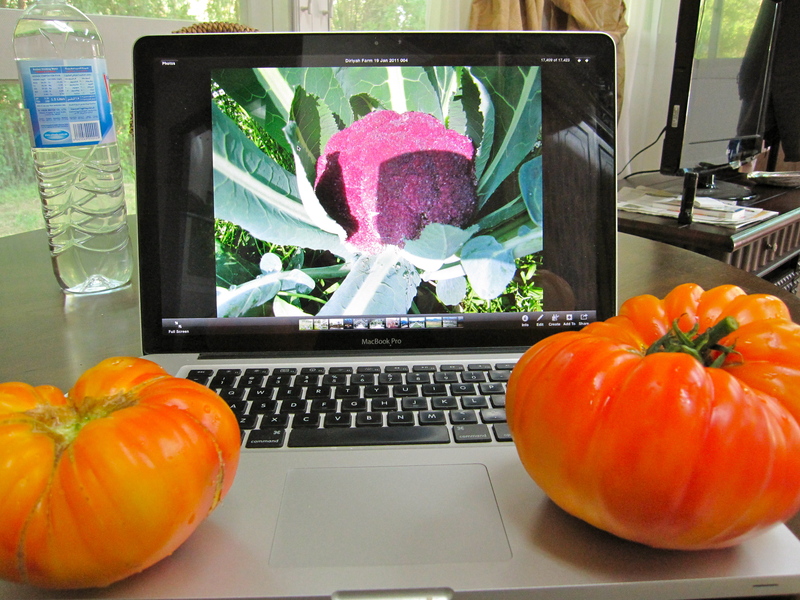 I organized all the seeds today and had a closer look at the greenhouses where there are glorious tomatoes and some very weak, and patches of disease here and there. There are no tags anywhere left to show what varieties are thriving and others weak so it is hard to tell what to recommend for future use. Going forward is a slow process here. Last modified on 2011-01-27 00:51:32 GMT. 0 comments. Top. 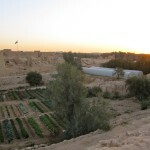 We are on our way to Saudi Arabia on February 1, 2011 to work on a organic garden. We will keep you updated on our progress. 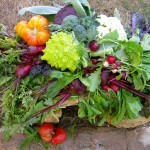 Welcome to Kate Frey Sustainable and Organic Gardens. Pacific Horticulture: A Lively Feast. Summer 2013. 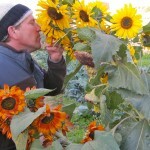 Pacific Horticulture: The Melissa Garden; a sanctuary and season of honeybees. Summer/fall 2009.